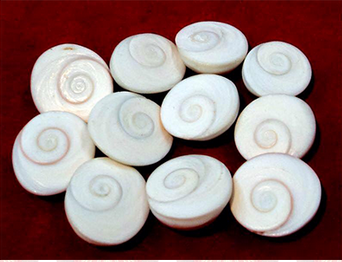 Gomti Chakra could be a rare natural and religious product, a style of shell stone. Gomti Chakra is found in gomti watercourse in Dwarka, a vicinity of Gujarat in Republic of India. Gomti Chakra is additionally called Sudarshan Chakra because it resembles the divine weapon of Lord avatar the Sudarshan Chakra. It believed to bring luck and is employed specially in religious and Tantrik rituals. A shell whereas the opposite aspect is flat with circular style like whirl that appears like a snake. This is often the explanation why its conjointly apprehended as Naag-Chakra i.e. snake chakra. In line with sacred text pseudoscience, it's helpful in cases of individuals World Health Organization have Naag dosh or SarpaDosha in their horoscope. Many leading politicians quality is entirely attributed to the Gomati Chakra and it's conjointly attained them conclusion by massive margins throughout elections.